I absolutely love reading and discovering new devotionals. It is a great way to gain different perspectives on a particular passage of scripture. 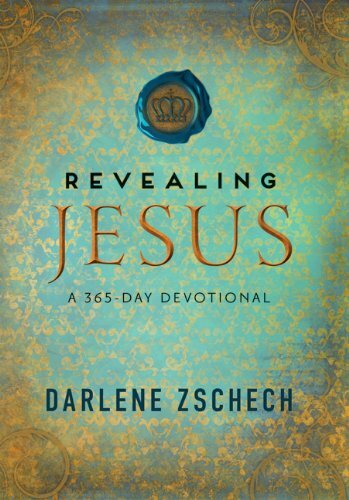 Revealing Jesus by Darlene Zschech is the latest devotional that I have picked up. You may be familiar with Darlene from her popular worship song, “Shout to the Lord.” She has a companion CD, with the same name, filled with scripture that can tie the reader’s heart and mind to this book. In Revealing Jesus, an attribute of God is highlighted each month and is carried out in the daily readings. Each day, Darlene focuses on a particular passage of scripture. I love how she utilizes various translations throughout the book. After the scripture, she gives a brief devotion that shows how the scripture is applicable in the reader’s life. Each day, Darlene closes with a short prayer. I love this devotional and would highly recommend it. Each one can be read quickly, but profound enough to stay with you throughout the day. It ties everything together – digging into God’s Word, applying it to our lives and prayer. Wonderful read!